When a fellow adventurer's helping hand is nowhere to be found, there are still dependable comrades you may turn to. 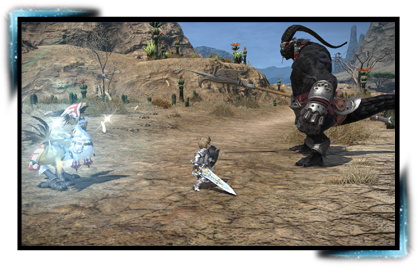 Fight side by side with your trusty chocobo, or have an adorable minion tag along to brighten up your journey. 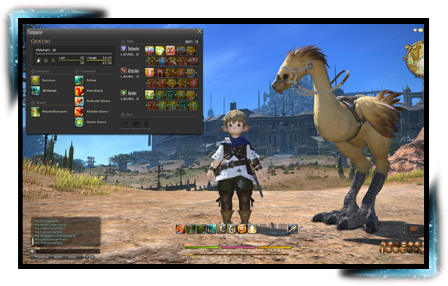 After fulfilling certain requirements, you can summon your chocobo companion into battle as an additional party member. While companions can fight of their own accord, there are times when it will prove advantageous to direct their actions. 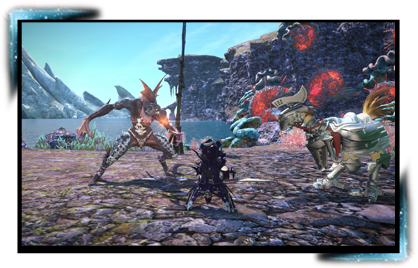 By switching between the four battle stances—defender, attacker, healer, and free stance—you can swiftly adapt to the ever-changing conditions of the battlefield. 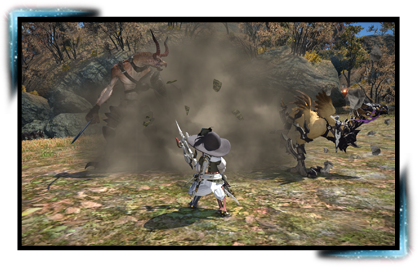 As your chocobo companion fights by your side, it will earn skill points that can be used to learn special actions. 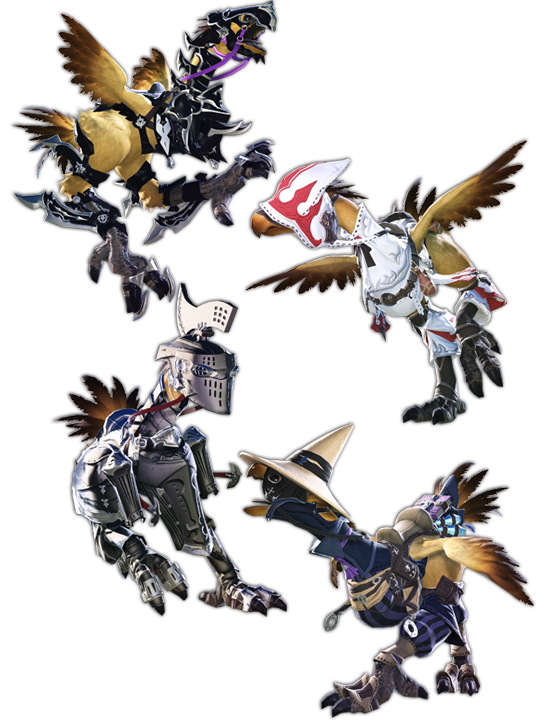 These actions are specific to certain battle stances, and it falls to you to decide how you wish to train your chocobo. 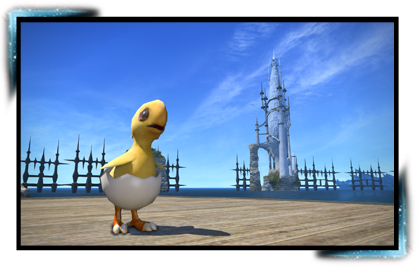 In this stance, your chocobo will seek to draw the enemy's attention by using enmity-building actions such as Choco Drop. 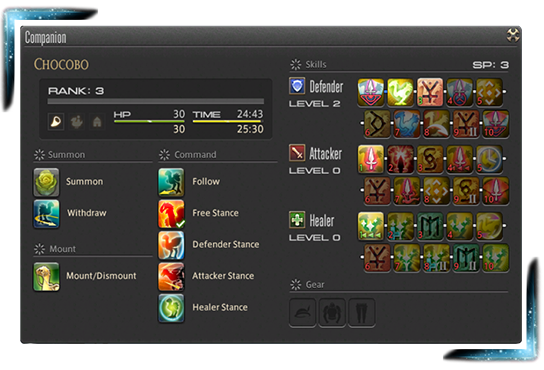 This is an ideal role for adventurers who want for a stout defense. In this stance, your chocobo will seek to overwhelm enemies with a combination of single target and area attacks such as Choco Slash and Choco Blast. This is an ideal role for adventurers who want for firepower. In this stance, your chocobo will endeavor to keep you in good health by using curative skills such as Choco Regen and Choco Cure. This is an ideal role for adventurers who want to play it safe. Minions are pocket-sized adventuring companions that come in a wide variety of forms. 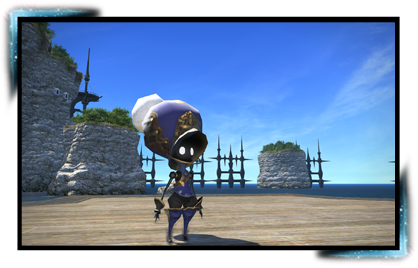 From magical dolls to miniature monstrosities, minions will follow you to the ends of Eorzea. A fully operational automaton born of the geinus minds of the Alchemists' and the Goldsmiths' Guilds. Until he finds his real mother, you'll have to suffice.